Skip out on the gluten-induced comas with these must-try recipes. For these gluten-free dishes, we turned to the people who know best and are experienced in cooking gluten-free. Our experts include cookbook author Elana Amsterdam, Shauna James Ahern (aka the Gluten-Free Girl), Food Scientist and TDM contributor Erin Swing as well as TDM’s own Editor Jess Kapadia. From appetizers to desserts, here are ten delicious recipes that won’t leave you in a gluten-induced coma. If you’re unfamiliar with gluten and where it hides, it is the protein found in wheat (durum, semolina, spelt, kamut), rye, barley, and farro. Also, because of cross contamination at processing plants, many oat products also contain traces of gluten. Present in most flours (but not all), gluten gives bread its elasticity and enables it to rise. Check out these sites for more information on gluten-free foods and Celiac disease (the auto-immune disorder that causes damage to the small intestines when gluten is digested). Elana Amsterdam uses almond flour to make this rich and creamy dessert gluten-free. From the Gluten-Free Girl’s cookbook, this salty and bright dish also comes with a recipe for homemade gluten-free pasta. Erin Swing worked hard to perfect a gluten-recipe for these whoopie pies, one of her favorite childhood desserts. A gluten-free pie crust creates the base for this creamy and tasty dish. Protein-packed chickpeas, bright lemon, and creamy tahini make this easy dip a hit. Just because you can’t eat gluten doesn’t mean you need to rid your life of the joy of chocolate chip cookies. Try this recipe from Blackbird Bakery. 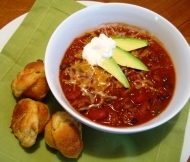 Spicy corn muffins with one-pot chili make a great winter meal for those who eat gluten-free and for those who don’t. This twist on classic bread pudding calls for a splash of Grand Marnier, an orange-flavored liqueur made with cognac. A simply contrived yet complex tasting appetizer, this dish is perfect for cocktail or dinner parties. An easy roast chicken recipe from Elana Amsterdam shows us that every day dishes can be naturally gluten-free – no substitutions needed. Click here to see the Common Gluten Misconceptions story. Click here to see the 5 Simple Gluten-Free Swap-Outs.